An overwhelming majority of Israeli Jews believe that the current negotiations with the PA will not lead to peace, finds Israel Hayom poll. An overwhelming majority of Israeli Jews believe that the current negotiations with the Palestinian Authority will not lead to a peace agreement, a new poll by the Israel Hayom daily newspaper has found. The poll, conducted by New Wave Research and released Friday, found that 87.5% of Israeli Jews do not believe that the talks will result in a peace agreement. 6% of Israeli Jews said they think the peace talks will lead to a deal, while 6.5% said they were not sure. The poll was released hours before U.S. Secretary of State John Kerry, on his latest visit to the region to push for progress in the talks, said the sides were “closer than they have been in years” to a deal. 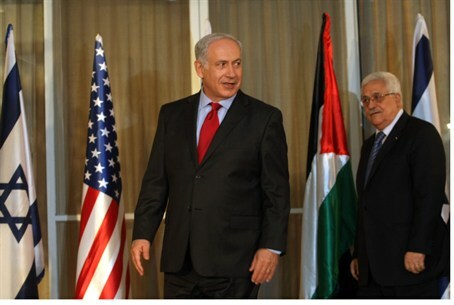 Earlier on Friday, Kerry met Prime Minister Binyamin Netanyahu for the third time in 24 hours. The two met twice on Thursday for more than six hours of talks about potential security issues in any peace agreement. Kerry also held a three-hour meeting in Ramallah with Palestinian Authority Chairman Mahmoud Abbas, who reportedly rejected every offer set forth by the U.S.
Chief negotiator Saeb Erakat told AFP the situation was "still very difficult and matters are complicated." A senior PA source was more direct, saying Kerry's security proposals "were very bad ideas which we cannot accept." In talks with Netanyahu on Thursday, Kerry and top security adviser General John Allen outlined their view of some of the security challenges likely to face Israel in the context of a final peace agreement. One report in the Maariv daily newspaper on Friday suggested that the Americans had agreed with Israel regarding its demand for IDF presence in the Jordan Valley even after a permanent agreement. Netanyahu has said Israel would only accept the emergence of a Palestinian state if it was demilitarized, with Israeli troops deployed along the Jordan Valley which is strategically crucial for the protection of Israel's borders in the event of war. Speaking to reporters after one of his Thursday meetings with Netanyahu, Kerry insisted that Israel's security was a top priority, both in talks with Iran on its controversial nuclear program as well as in a peace arrangement with the PA. In late November, senior Palestinian Liberation Organization (PLO) official Nabil Shaath revealed that the PA is only staying in the peace talks to release all 104 terrorist prisoners promised as a "gesture." On Tuesday a senior EU official threatened the EU would take action against both Israel and the PA should talks fail. According to the official, the EU would cut its 300 million Euros ($407.7 million) annual aid to the PA, and revive its plan to label Israeli products manufactured in Judea and Samaria.